Jamious Griffin has been truly dominant all season long. 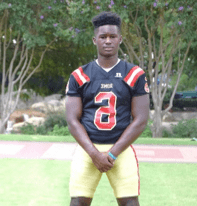 This particular week Jamious rushed for 339 yards and two touchdowns and also threw a 31-yard TD pass in a 62-14 beating of East Paulding. Jamious has 1497 yards and 22 total touchdowns on the season and is averaging 213.9 yards per game. The NC State commit has Rome undefeated and ranked #1 in 5A.